The U.S. State Department’s warning recognizes that Mexico’s tourism areas do not experience the safety issues seen along the Texas border. In fact, 27 States and the Mexico City Federal District have no advisories or limited advisories outside of their tourism areas. Travel to only 4 States is advised postponed or avoided. These are States where vactationing is enjoyable, but travel outside of the touristic areas may place you at higher risk. Cartel violence does not target tourists or touristic areas, but it can be present in other parts of these States so some caution is advised. Aguascalientes Avoid the Zacatecas border. Colima Avoid the Michoacán border. Guerrero Keep to Acapulco, Zihuatanejo, and Ixtapa. Jalisco Guadalajara and Puerto Vallarta are warm, welcoming areas. Avoid the Michoacán and Zacatecas borders. Michoacán Keep to Morelia & Lázaro Cardenas. Nuevo Leon Keep to the area of Monterrey. San Luis Potosi Keep to San Luis Potosi city. Sinaloa Keep to tourism areas of Mazatlan. Sonora Keep to the area of Puerto Peñasco. Zacatecas Keep to Zacatecas city. 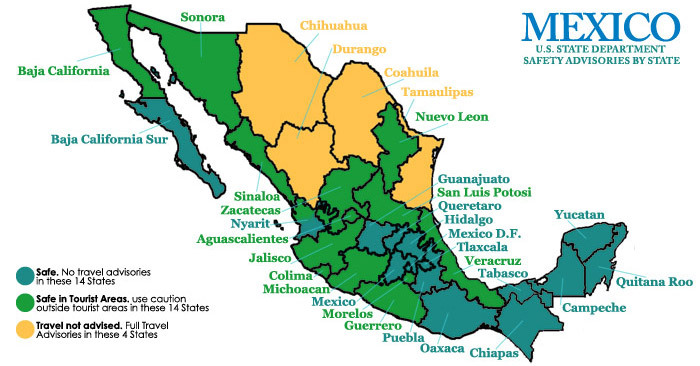 * The entire southern region of Nayarit has no advisories as shown in the map above. This region extends well beyond the famous Riviera Nayarit resort areas on Banderas Bay. Some caution is advised in the region to the north of the historic capital, Tepic. Which States should be avoided by travelers with safety concerns? The U.S. State Department recommends against travel to 3 states along the Texas border and the state of Durango because of cartel violence. Visitors should exercise extreme caution. While the entire nation of Mexico is showcased as dangerous. These are the States where cartel violence has been focused. It is irresponsible to suggest that every inch of any country or state is completely safe or unsafe. So it is important to note that the violence in the 4 states above seldom targets tourists, making it statistically less likely that tourists will become victims. Yet, the crime rate in those areas is significantly above the national average. Those wishing to avoid the 4 states identified by the U.S. State Department have 28 other states to explore that are statistically safer and at least as beautiful. Travel safely. Information on this page is based on the advisory on the U.S. State Department website. It is a controversial site worth reviewing as part of a complete snapshot of the safety issues of one of the world’s most fascinating destinations.